Make a box large enough to hold four dry cells and use it as a base to mount the motor on and to support the revolving cylinder. Anyone of the various battery motors may be used to supply the power. The support for the cylinder is first made and located on the cover of the box in such a position that it will give ample room for the motor. The motor base and the support are fastened by screws turned up through the cover or top of the box. The location of these parts is shown in Fig. 1. The core for holding the cylindrical wax records is 4-1/2 in. long and made of wood, turned a little tapering, the diameter at the small or outer end being 1-5/8 in., and at the larger end, 1-7/8 in. A wood wheel with a V-shaped groove on its edge is nailed to the larger end of the cylinder. The hole in the core is fitted with a brass tube, driven in tightly to serve as a bearing. A rod that will fit the brass tube, not too tightly, but which will not wobble loose, is threaded and turned into the upper end of the support. The core with its attached driving wheel is shown in Fig. 3. The dotted lines show the brass bearing and rod axle. The end of the axle should be provided with a thread over which a washer and nut are placed, to keep the core from coming off in turning. The sound box, Fig. 2, is about 2-1/2 in. in diameter and 1 in. thick, made of heavy tin. The diaphragm, which should be of thin ferrotype tin, should be soldered to the box. The needle is made of a piece of sewing needle, about 1/8s in. long, and soldered to the center of the diaphragm. The first point should be ground blunt, as shown in the sketch. When soldering these parts together, take care to have the diaphragm lie perfectly flat and not made warping by any pressure applied while the solder is cooling. The tin horn can be easily made, attached to the sound box with a piece of rubber hose and held so it will swing the length of the record by a rod attached to the top of the box, as shown. The motor can be controlled by a small three or four-point battery rheostat. --Contributed by Herbert Hahn, Chicago, Ill. Secure a piece of tubing about 1-3/4 in. long that will fit the connection to the reproducer, and wrap a quantity of heavy thread around one end as shown in the enlarged sketch A, Fig. 1. Form a cone of heavy paper, 9 in. long and 3 in. in diameter, at the larger end with the smaller end to fit the diameter of the tube A, making it three-ply thick and gluing the layers together. 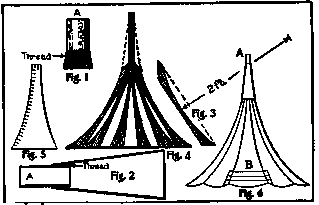 Attach this cone on the tube A where the thread has been wrapped with glue, as shown in Fig. 2. Fig. 2 is also an enlarged sketch. Make ten pieces about 1 ft. 10 in. in length and 3 in. wide from the thin boards of a biscuit or cracker box. Cut an arc of a circle in on a radius of 2 ft. (Fig. 3). Make a 10-sided stick, 12 in. long, that will fit loosely in the tube A, to which nail the 10 pieces as shown in Fig. 4, connecting the bottom by cross pieces, using care to keep them at equal distances apart and in a circle whose diameter is about 2 ft. The cone is placed over the stick as shown by the dotted lines in Fig. 4 and temporarily fastened in position. Cut out paper sections (Fig. 5) that will cover each space between the 10 pieces, allowing 1 in. on one side and the top, in which to cut slits that will form pieces to overlap the next section and to attach with glue. Fasten the sections all around in like manner. The next course is put on in strips overlapping as shown at B, Fig. 6. Finish by putting on sections in the same way as the first course, making it three-ply thick. Remove the form, trim to suit and glue a piece of paper over the edge. When the glue is thoroughly hardened, put on two coats of white and one of blue paint, shading it to suit and striping it with gold bronze. 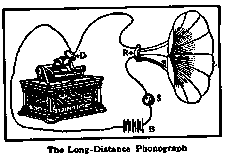 An interesting experiment, and one calculated to mystify anyone not in the secret, is to transmit the music or speech from a phonograph to another part of the house or even a greater distance. For an outdoor summer party the music can be made to come from a bush, or tree, or from a bed of flowers. The apparatus is not difficult to construct. The cut shows the arrangement. 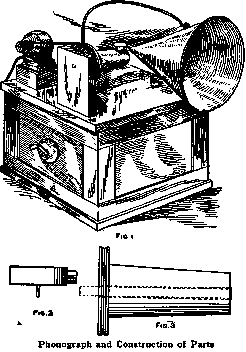 Procure a long-distance telephone transmitter, D, including the mouthpiece, and fasten it to the reproducer of the phonograph. Also a watch case receiver, R, which fasten to the horn. These parts may be purchased from any electrical-supply house. Connect two wires to the transmitter, running one direct to the receiver, and the other to the battery, thence to a switch, S, and then to the receiver. The more batteries used the louder will be the sound produced by the horn, but avoid using too much battery or the receiver is apt to heat. --Contributed by Wm. J. Farley, Jr., Camden, N. J.